This card makes me happy. I love the fresh, spring colors, the bit of sparkle from the sequins, the texture from the wood veneer flowers and the pop of black from the sentiment sticker. Most of the elements on here came from various Paper Issues Swag Bags. These kits are great for card making and all sorts of other projects, like pocket scrapping and layouts. I so look forward to its arrival each month! I pull the pretty glassine bag out of the package, gently peel back the washi tape seal and sift through the little bits and pieces over and over. If you love embellishments and trying new products as much as I do, think about trying the kit. You can sign up for a one-time delivery, a monthly subscription or even the new 6-month subscription (it's a great gift idea, by the way). Use the code LISA20 and you'll get 20% off (applies to anything you order, any time). And I thought that I was the only one whooped the sound of opening up the packaging of a scrappy treat! Love your beautiful card, Lisa! So beautiful! LOVING the colors!!!!!! It's a very happy card and I love the colors too. Love those swag bags. Waiting on mine. 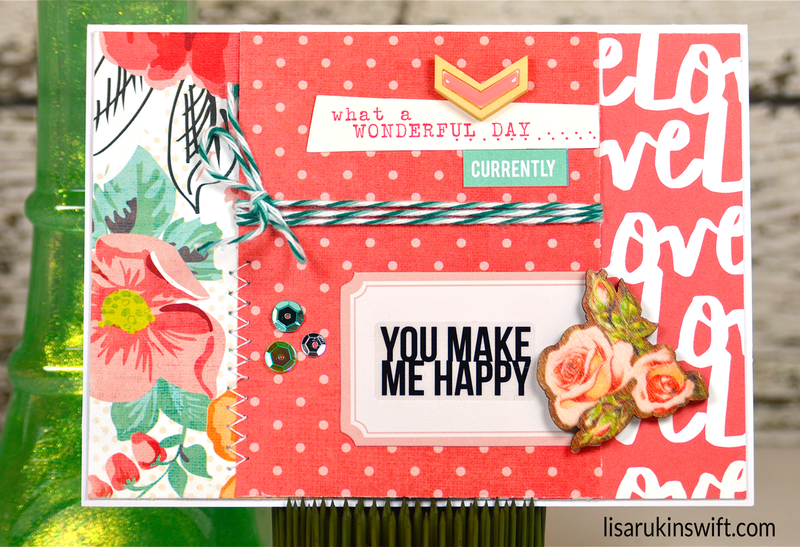 Love your bright and cheery card, Lisa, such a fantastic array of fun bits on it! This is such a fun happy card! Love it! Very pretty card ! Love the wood flower and the twine ! Well, I tell you what!!! This card makes me oh, so happy too!!! Love the colors and how you blended so well and added pops of the blue by way of sequins and twine!! This card just has such a pleasing flow to it and is just such eye-candy!! My favorite thing is the wood/enamel chevron pointing to the sentiment What a wonderful day!! Just makes me smile and my heart feel happy!! Have an amazing day!! Such a cheerful card! I like your use of twine. Gorgeous card! Love the coral color!!!! Love the mix of Reds and a Pinks, Lisa! And the wrapped twine is so fun!